Couples, businesses, and organizations are invited to attend the 2019 Evergreen Wedding & Event Showcase, being held at Evergreen Lake House on Sunday, March 31, 2019, from 11 AM - 2 PM. Overlooking scenic Evergreen Lake and ringed by ponderosa pine forest and the elk-dotted Evergreen Golf Course, Evergreen Lake House provides an idyllic mountain setting for weddings, parties, special events and meetings. Located just half an hour from Denver, the Lake House hosts events year-round, combining the elegance of vaulted ceilings and dazzling views from every window with the rustic log cabin charm of a mountain getaway. The Wedding & Event Showcase offers participants the opportunity to sample food while experiencing the ambiance of Evergreen Lake House and gathering information about special event vendors and service providers. PRE-REGISTER at 720-880-1300 or lhstaff@eprd.co. Evergreen Lake House is operated by Evergreen Park & Recreation District (EPRD). It is located at 29612 Upper Bear Creek Rd., Evergreen, CO 80439. 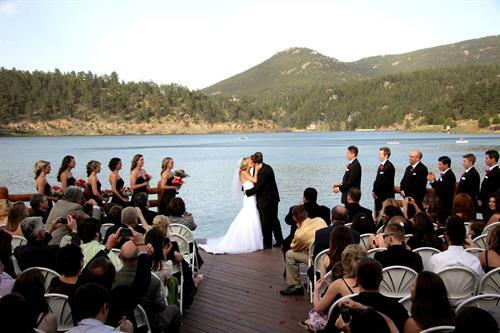 Learn more about Evergreen Lake House at http://www.evergreenrecreation.com/Facilities/Evergreen_Lake_House/Weddings_-_Rentals_-_Events.htm. For more information about the Evergreen Wedding & Event Showcase, please email lhstaff@eprd.co, or call 720-880-1300.